Towards the end of 2016, a new craze took the world by storm – the Mannequin Challenge. The challenge, which since its inception has gone viral on the Internet, inspires big crowds to become frozen in time as a camera pans over them. Once a clip has been recorded, the footage is shared on social media with the hashtag #MannequinChallenge. The first Mannequin Challenge video has been attributed to High School students in Florida, who were possibly inspired by bullet time scenes from science fiction films such as The Matrix and X-Men: Days of Future Past. The challenge soon picked up steam on Twitter and Instagram, going from high school cafeteria to high school gym, inspiring school spirit along the way. So it seems only fitting that students at the ESC should follow the trend. Not to be outdone by the likes of Hillary Clinton and the Borussia Dortmund football team, our students did a fantastic job striking a pose during the Christmas Assembly. 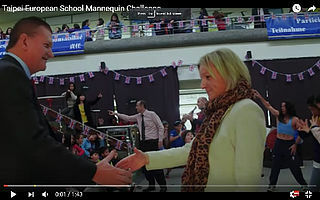 Enjoy watching the Taipei European School Mannequin Challenge!